Airlines do not like Power Banks. For those who do not know what a power bank is: It is a battery! The modern battery technics make it possible to store a lot of energy in a battery. There are all kind of Lithium based batteries, most famous is Lithium-Ion. A lot of power, small seize and low in weight. That is exactly what people need now a days for their smart phones and other electronic devices. By law airlines can carry only a certain number of kilos of these batteries. If this kind of battery is damaged it might cause a fire. If not packed carefully in your suitcase and hit by a second suitcase it is possible the power bank is damaged. Too many of these batteries can cause a huge fire that might destroy a plane. Safety comes first for airlines so they might stop your power bank from boarding or ask you to pack it correctly before entering the plane. 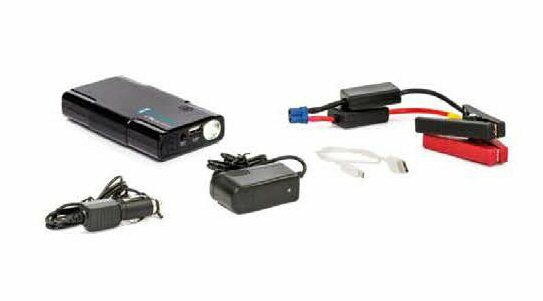 The first power banks were basically backup batteries for your electronic devices. Empty phone? – connect to a power bank and recharge! Now a days the power banks have lots more power. Even so much that you can start your car with a modern power bank. Some can deliver 200 Ampere and even 400 Ampere as a peak current!! Recently Midland introduced their ENERJUMP. The dimensions are just 131 x 75 x 25 mm. 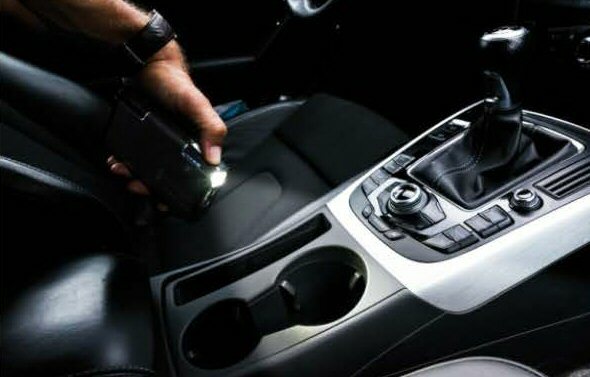 It can be used to charge electronic equipment, it can be used as a flashlight and and it can be used to start a car when the car battery is empty. Read what the Midland people say about the new product. 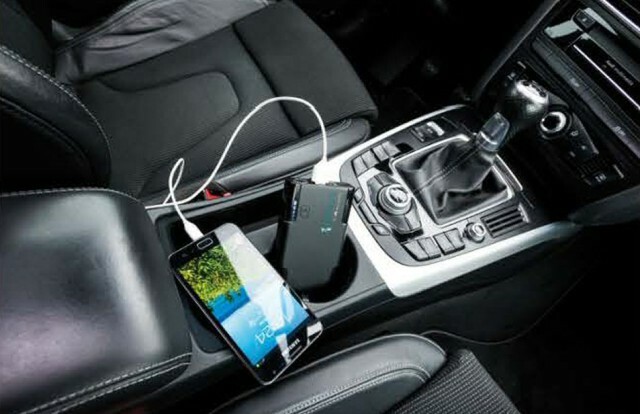 If the battery of your vehicle or electronic device goes dead, you have a new equipment to face up the emergency! Nowadays we can no longer do without a reserve of energy for all our electronic devices that we daily bring with us. 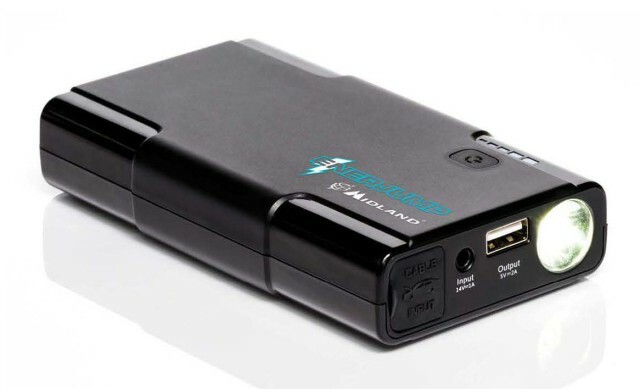 ENERJUMP is a powerful powerbank with USB port, able to recharge several times all portable electronic devices ‐ such as smartphones, tablets, BT Intercom equipment, XTC action cameras , mp3… every where and without the need of a main socket. It completely recharges your i-Phone up to 3 times! 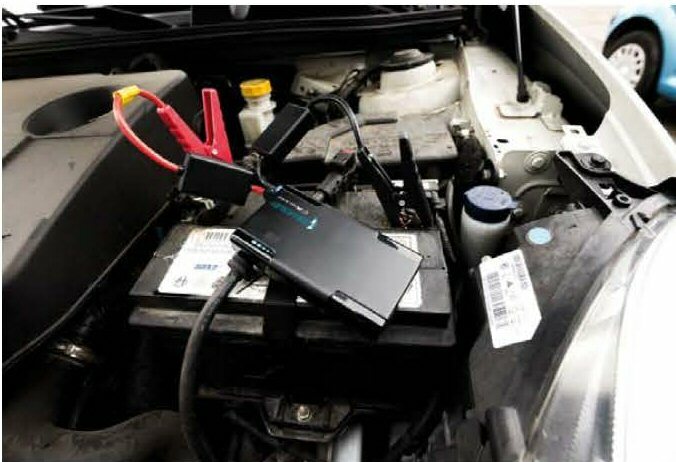 But the extraordinariness of Enerjump is the capability to jump‐start your battery without the need of another vehicle! No matter if it’s about your car, motorbike, quad or camping van, you don’t have to ask for help to anybody, anymore! Despite its reduced size and thanks to its 12V output with a high peak current, ENERJUMP has enough power to jump start your vehicle when the battery is dead. Just connect the jumper cables and its clamps (red +/ black ‐ ) supplied in the packaging to the vehicle’s battery, turn on Enerjump and start your car! ENERJUMP is also equipped with a powerful built‐in Led flashlight, able to light up SOS emergency signalling (intermittent flash) . The 5‐led charge indicator clearly shows you the charge level. ENERJUMP is ideal for everyday use or roadside emergencies; so remember to take it always with you, in your daily activities or adventures! I must admit I love this product. It comes in a handy carry case, it has so many possibilities and it gives you a more safe feeling. But there are also some remarks to make. At cold weather (more than minus 5ºC) it is not advised to leave the Enerjump in your car. But that are also the best nights to charge the Enerjump to make sure you have power. Second remark is that I did not find out yet what is the self-discharge of this item. The used Lithium-Cobalt battery has low self-discharge, but it also depends on local temperatures and charging disciplines. And while I start charging my Enerjump you can watch a funny video from Midland Italy about this product. This entry was posted in Telecom, Travel Center Products and tagged avera, Enerjump, midland, Power bank, Powerbank. Bookmark the permalink.